Built on wood pilings, the building was on the verge of being condemned in 1947 when pieces began falling into the harbor. The Gronsky family bought and modernized the pavilion before reopening it in 1949; they sold it in 1961. Eight years later, owner Phil Tozer added an oak staircase and a saloon to match the Victorian architecture. 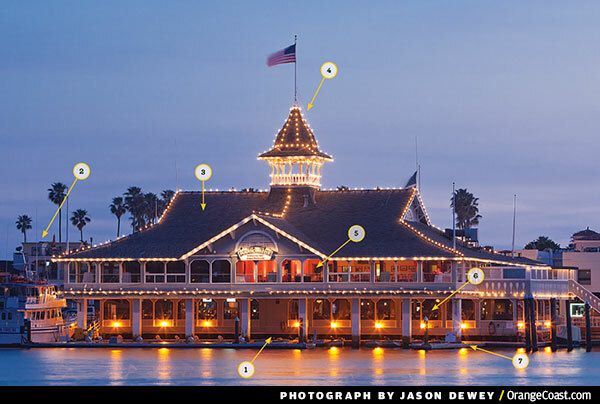 Promoters formed the Newport Bay Investment Co. to finance the pavilion’s $15,000 construction, and made that back within a year by selling nearby lots for vacation homes. Parcels with promises of sewers and streetlights were advertised for as low as $300. During the Great Depression, patrons played blackjack, penny roulette, and other games in card rooms. Licensing fees from the lucrative, legal gambling kept the town afloat—a far cry from the ’50s when deputies shut down a bingo parlor. The cupola and roofline are recognizable in silent-filmmaker Buster Keaton’s “College” (1927), in a race between rowing teams, and in “The Cameraman” (1928), as the Westport Yacht Club. Renovation in the ’20s made room upstairs for what was, for a time, the county’s only dance hall, attracting musicians such as Benny Goodman and Artie Shaw. The Balboa, an eight-count WWII-era swing dance, has its roots here, but the fast-moving jitterbug was banned due to the building’s deterioration. The Harborside Restaurant opened in 2002 with a dining room that seats about 190. The seafooder claims the “longest happy hour in town”: noon to 7 p.m. daily. In the ’30s, sirens warned canoeists that speedboats were about to be launched at high speeds. Because a 5-mph rule was put in place, the Gronskys had to wait until they left the harbor before opening the throttle of their Leading Lady speedboat. See the pavilion in Buster Keaton’s silent movies and learn how to dance the Balboa here.